Just add Applesauce and Cinnamon in a bowl. You will use lots of cinnamon. You want it to become almost the consistency of playdough. We used the little applesauce cups. 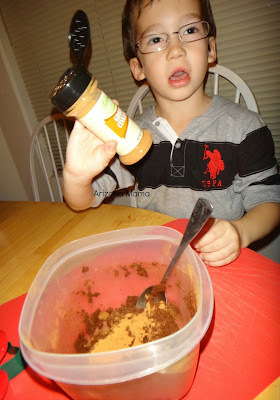 We used 2 of them and about 1 1/2 containers of Cinnamon. Your going to want something to put these on like a cookie sheet, cutting board, or parchment paper. And expect your hands to get real dirty. Once the dough gets the consistency you want get out a handful and kneed it and roll it until it is the thickness you want. The thicker the less likely to break, but they also take longer to dry. 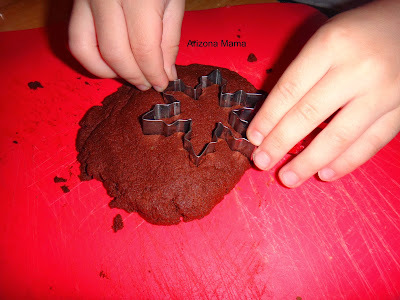 Once it is laid out grab the cookie cutter you want and press it into the dough. Remove the excess dough from around the cookie cutter and you have your ornament. There are 2 ways to do the ribbon. Either you can use a straw or something to make a hole in the top to put the ribbon through or stick the ribbon into the dough prior to using the cutter. When Jayden and I made these the other night I could not for the life of me remember how to add the ribbon so I added it in the dough. But as I remember from before the straw thing works much better. But this way works too. After you have cut out all your ornaments and placed them on your tray, let them dry. I usually just leave them out for a day or three. Turn them over every so often to allow more even drying or put them on a drying rack. I know some people put them in the oven to dry also. I have not tried this since I learned in a classroom without an oven. Once they are dry then you can add your ribbon if you have not already and hang on your tree. These ornaments smell so yummy like cinnamon. These make great gifts and air fresheners. Jayden made one for each of his grandma's and his Nana. He of course wanted to make some for our tree. This looks like fun, and I love the idea of it smelling so good for so long! I haven't made these since my son was about Jayden's age. I still have one and it's been about 20 years! All the smell is gone, but I use some scented oil on it and it smells great again. Thanks for the memories! This looks like fun, my son would love getting his hands into this.